A tweed suit is a statement of quintessential British gentleman’s style. An unfinished wool fabric originating in Scotland, tweed was traditionally used for clothing intended outdoor activities such as shooting, hunting and fishing because of its warmth, ability to repel water and excellent durability. Although often considered a fabric reserved for wear by the upper class, following World War II academics adopted the wearing of tweed suits and jackets. Today, tweed suits and particularly jackets are re-emerging as fashionable once again, with tweed featuring in casual, preppy and vintage looks on the catwalk on a yearly basis. Whether you view tweed as a bastion of British upper class fashion or a current trend, there is no denying that tweed suits have stood the test of time. For total authenticity a tweed suit made from Harris Tweed is the way to go. However, gone are the days where tweed means a fabric rough enough to feel like sandpaper against your skin. Modern versions of tweed can be considered luxurious and even, yes, soft. Tweed inevitably has varying colours within the weave, and this allows for tweed suits to be made with a variety of patterns in the fabric including herringbone, checked and feathery. Because of the way the fabric is weaved with varying colours, a level of depth is also created in the pattern creating a unique visual that can only be found in this kind of fabric. Whether you choose to wear a two-piece or three-piece tweed suit, there are some basic rules you should follow. The first important step in wearing tweed is making sure your suit is the right fit for you. Through our measuring and fitting process, our expert tailors at Henry Herbert will ensure your bespoke tweed suit is cut to fit and flatter you superbly while still fitting your sporting or fashion needs. Secondly, you should consider the versatility of your tweed suit or jacket. Generally speaking, the more complicated the pattern the less versatile your garments will be. Earthy tones of tweed are more suited to a day in the country while darker shades work well for a more urban night out. When considering what to wear under your tweed suit, it’s best to keep it simple. Most of the time tweed is best worn with a plain shirt or jumper. Finally, it’s important to ensure your choice of shoes complements your tweed suit – suede shoes or brogues will finish off your look nicely. Henry Herbert Tailors offer a specialist service tailoring tweed suits out of the finest tweed and our tailors come to you to provide our bespoke service. 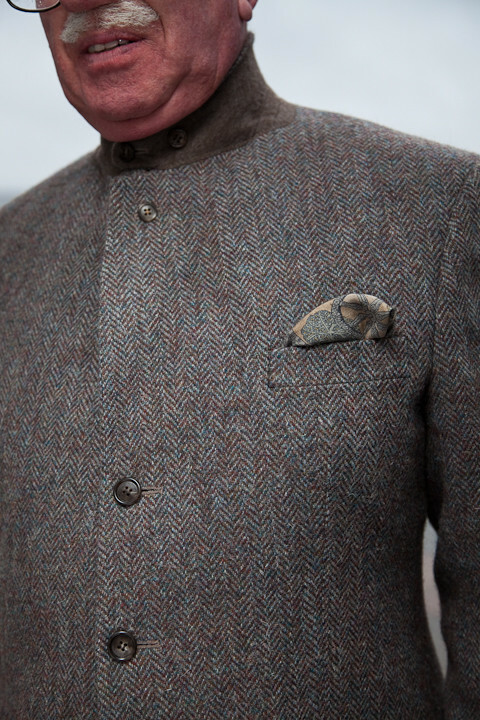 Tailored Tweed Jackets and Tweed Suits from Henry Herbert Tailors. Today, tailored tweed suits and particularly jackets are re-emerging as fashionable once again, with tweed featuring in casual, preppy and vintage looks. Henry Herbert Tailors (London) offer a specialist service tailoring tweed suits and jackets out of the finest tweed.